The weather has broken. The first summer we were in the Imperial Valley the heat was exciting. This past summer it was just hot. We now complain that it is too cold. Over the weekend there was a weather advisory out of Yuma. It was expected to be under 60 degrees and they were warning people to be careful if they were going out to the parade. On Monday we took our fist hike of the season. We hiked 4500 feet up into the Jacumba Wilderness - all the way to the border. This is a hike I have wanted to do for the last two years. 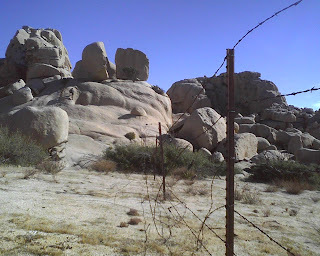 In the wilderness area the border is a broken barbed wire fence. This is not the billion dollar fence you see across the desert from the highway. 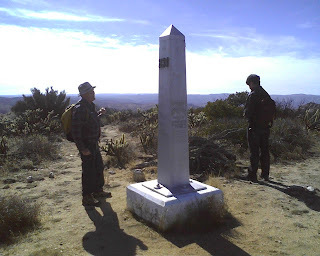 We hiked another mile or so to the boundary monument. The border of Mexico was set by the Treaty Guadalupe Hildago Treaty of 1848, and reconfirmed by a survey in 1889. Between 1891 and 1894, 258 boundary monuments were erected along the border. Monument 231 is on Blue Angle Peak in Jacumba. From this vantage point we could see the mountains on the east side of the county and the Salton Sea, both 60 miles away, as well as El Centro, Ocotillo, and Jacumba. 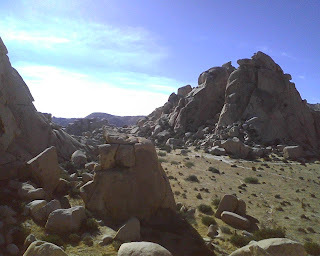 This whole area at one time was the home of the Kumeyaay. The border was placed right through their native lands and today there are reservations both in Mexico and in the US. At the museum we have written a couple grants talking about the artificial border that separates the indigenous peoples. From where we were hiking you could see the US border going both directions, as if it were a giant line drawn in the sand. I had never experienced it like this before. It was truly amazing. It really looks like an artificial demarcation. A line we have drawn and dared people to cross. This was a very tough, but very cool hike. Well worth the 19-month wait. The people I was with wanted to go across the border and get a picture looking back at us. I told them they were going to set of the motion detectors. On our way back down we were met by three Border Patrol jeeps. They asked us if we had seen anyone hiking, someone had tripped the monitoring device. So I guess those are real. We will be more careful next time.